Central site for the Vientiane Hash House Harriers, the Vientiane Bush Hash House Harriers, and the Sepon Hash House Harriers. Events, pictures, and history. The Chiang Mai Hash House Harriers and Chiang Mai Underground Male Hash House Harriers. Drinkers with a running problem in Chiang Mai, Thailands second city. Schedules, contacts, news, and photos. Contains an overview of the Absolut Hash House Harriers, the Underground Hash House Harriettes, and the Full Moon Beserkers. Contains news items, pictures, and a listing of upcoming runs. The Galveston Hash House Harriers commenced running Hare and Hounds trails in and around Galvestont, Texas on 12 May 2001. Includes contacts, news, and photos. The Saskatoon Hash House Harriers lay Hare and Hounds trail in and around Saskatoon, Saskatchewan. Upcoming events, contacts, photos. The Texoma Hash House Harriers have been running Hare and Hounds trails in Wichita Falls, Texas since 2 Feb 1999. Here youll find schedules, contacts, and photos among other information. The Orlando Hash House Harriers is a running club meeting every other Saturday. Trail is usually three to five miles with plenty of shiggy. The Survivor Hash House Harriers of Pensacola, Florida have been laying trail on alternate Saturdays since 31 March 2001. Information for the late St. Pete Hash House Harriers, no longer running in Saint Petersburg, Florida. Everything you need to know to run Hare and Hounds trails with the Hash House Harriers in Madrid, Spain. News, records, contacts, directions to next run. Home page of the La Jolla Hash House Harriers, the running club with a drinking problem. Aloha Hash House Harriers Home Page. The drinking club with a running problem. How to contact the Tulsa Hash House Harriers, a group dedicated to running Hare and Hounds trails in and around Tulsa, Oklahoma since 1992. The Hurricane Hash House Harriers run in the West Palm Beach area on alternate Wednesdays, and whenever a hurricane comes within 150 miles of south Florida. The Bump and Hump Hash House Harriers run 'Okinawa style' Hare and Hounds trails in the Reno, Nevada area. Site includes contacts and directions to the next run. Schedules, news, pictures, and general information about Hashing from the Onslow County Hash House Harriers, a club devoted to staging Hare and Hounds runs in eastern North Carolina. The Washington DC Hash House Harriettes and Harriers, laying Hare and Hounds trails near the nations capital since 1978. Schedule and photos. Everything you always wanted to know about Cairo Hash House Harriers, including contacts, schedules, and photos. If the business hours of Burlington Hash House Harriers in may vary on holidays like Valentine’s Day, Washington’s Birthday, St. Patrick’s Day, Easter, Easter eve and Mother’s day. We display standard opening hours and price ranges in our profile site. We recommend to check out burlingtonhash.com/ for further information. 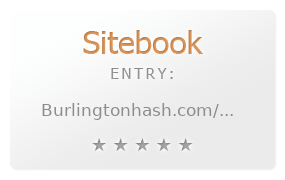 You can also search for Alternatives for burlingtonhash.com/ on our Review Site Sitebook.org All trademarks are the property of their respective owners. If we should delete this entry, please send us a short E-Mail.